Being a Westerner sometimes I just get that craving to have a good hamburger. Coming from a country that loves to eat junk food I am pretty spoiled on what I consider a yummy burger. I have gone to a few places in Thailand in the past where I am usually greeted with a below average hamburger. However, there are a few places that I do enjoy and one of those restaurants is Beast Burger in Chiang Mai. I am not going to say Beast Burger is as good as my favorite places in the West but they do satisfy my cravings and deliver a tasty product. Beast Burger actually started out as a Food Truck that visited the popular and trendy Nimmanhemin area in Chiang Mai. I remember heading over to that truck when those cravings came over me and enjoyed a juicy burger. Usually eating the meal outside where they had a few tables set up around the truck. 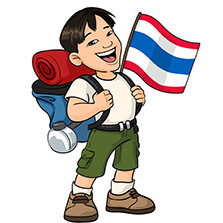 It was often quite busy with tourists, expats and even some local Thai people that enjoyed chowing down. 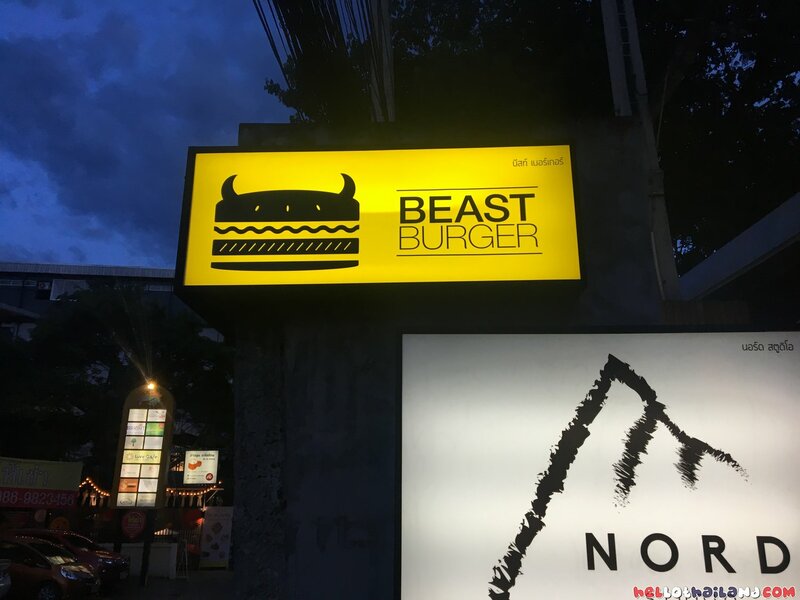 Beast Burger obviously did quite well and upgraded from that truck to a sweet little restaurant which is also located in the Nimmanhemin area of Chiang Mai. 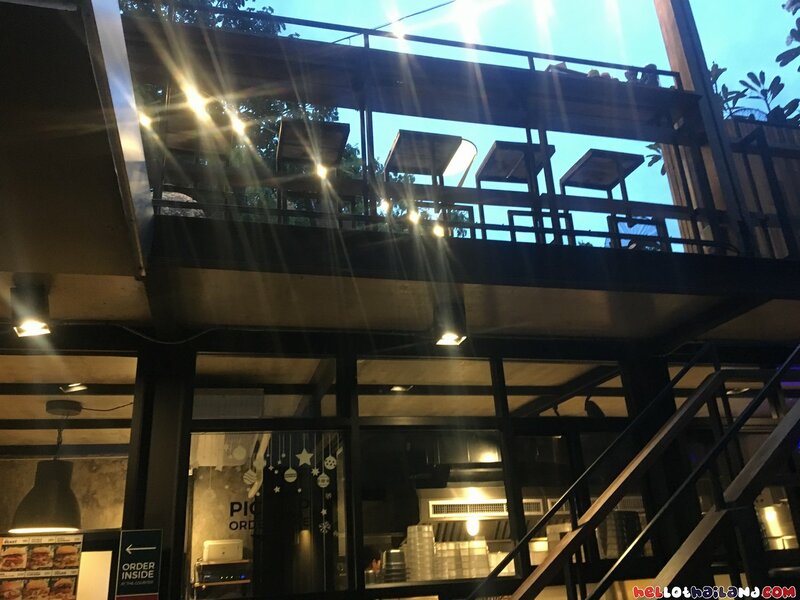 Now they have an air conditioned indoor area with a number of tables that overlook the street. You also have the option to walk upstairs and sit outside on their balcony area. At least when the weather is not too hot as it can get pretty toasty up there under the Thailand sun. The menu is pretty simple. They have a number of different burgers for you to enjoy. Beef, Pork, Chicken and even Vegan are all available. The side orders are three different kinds of Fries. You pick the burger you want, the fries and any extra toppings are you are good to go. My Thai girlfriend absolutely loves the pulled pork burger. I personally enjoy the good old beef standard the most. The fries have always been hot and fresh and you can tell they are cooked when you order and are not waiting for you under some heat lamp. The same goes with the burgers as well. You can also tell the staff how you want your burger prepared such as medium well. The restaurant has always been quite clean when I have visited the establishment. They have staff that will quickly remove trays when you leave. 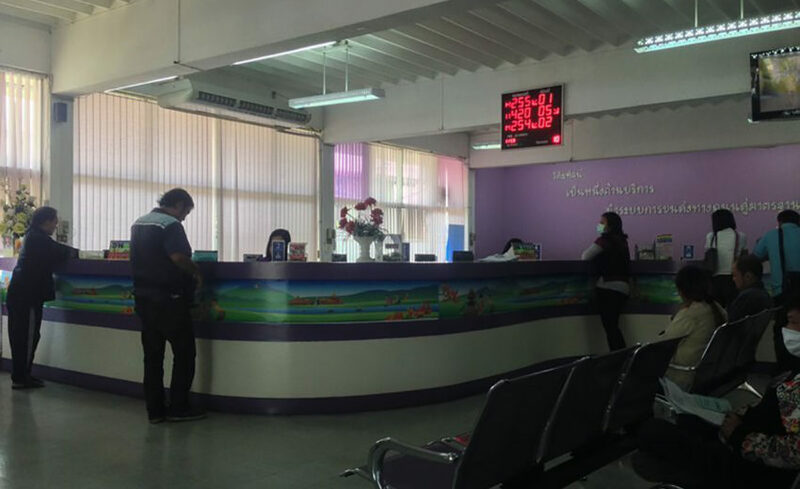 The front desk staff are very nice and one of them speaks excellent English. When you order you are handed a little buzzer that you can take with you to your seat. When the meal is ready it will buzz and you can zip up and collect it. You can also get take out if you want to bring the food home with you instead. 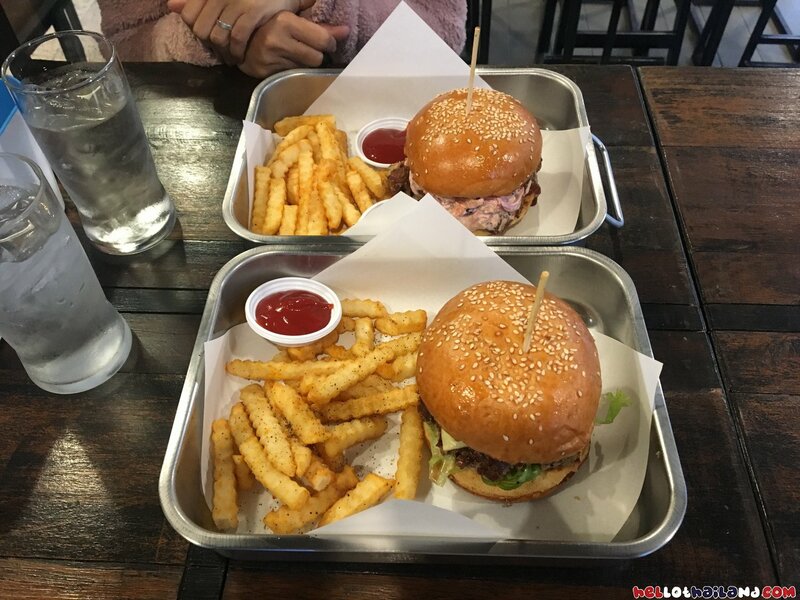 I really enjoy Beast Burger and think it is a good quality burger joint. Food seems fresh, the meat is moist and tasty and the fries are always crisp and hot. 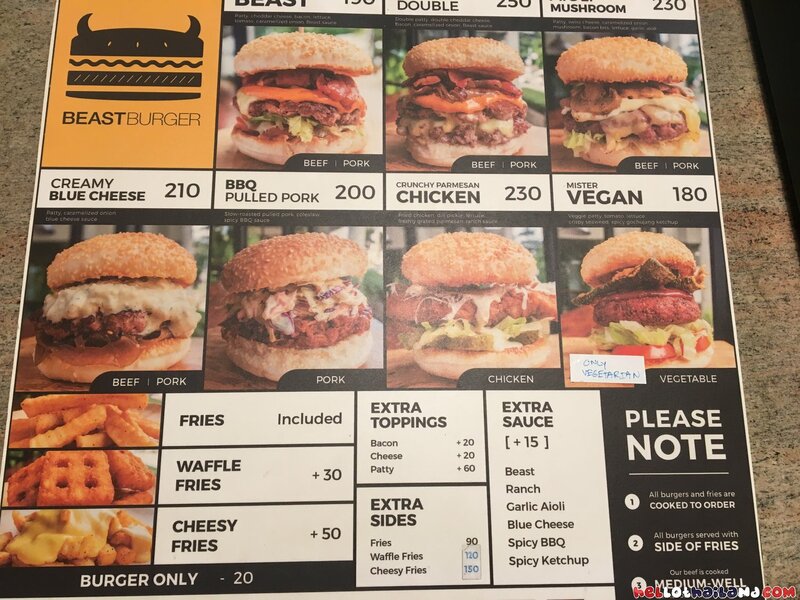 The price might be a little more than what some would expect to pay for a burger in Thailand. Compared to Western prices it is just fine by me. One thing you should be aware of are the hours of the restaurant. They are a bit unusual. 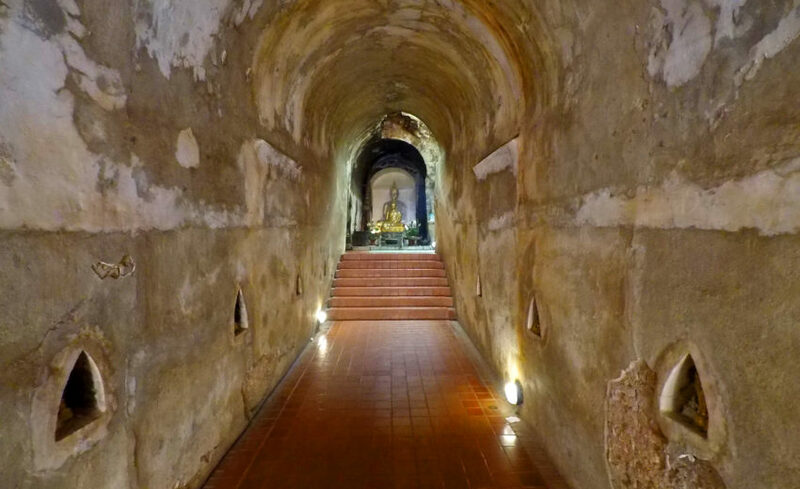 Firstly, Sundays the restaurant is closed completely. During the week Beast Burger is open from 11am to 2pm and then re opens at 5pm to 930 pm. So please keep that in mind. 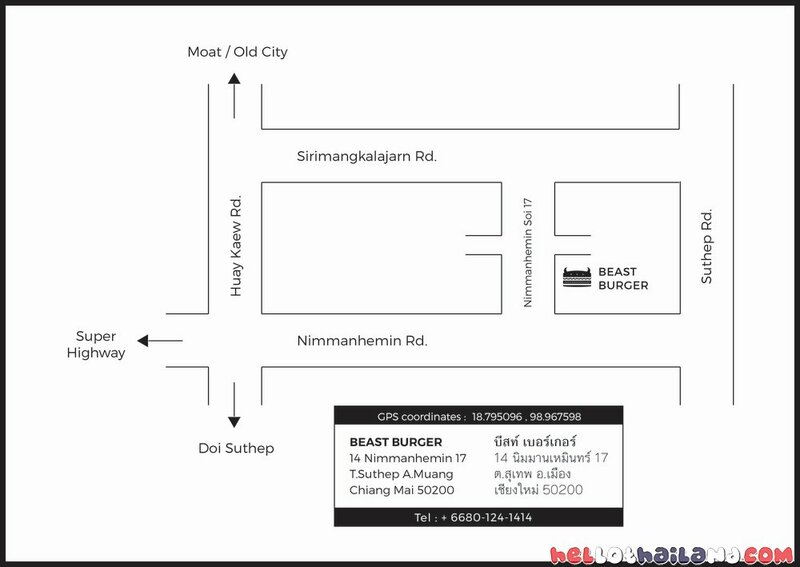 Here is a map of the restaurant below taken from the Beast Burger Website which you can also visit. 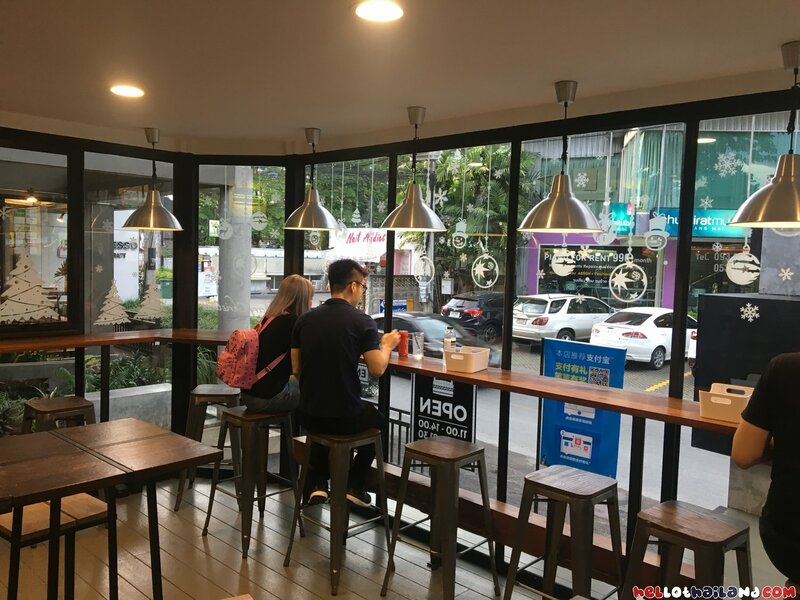 Thanks as always for stopping by Hello Thailand and when you are in the mood for a Burger then please check them out.